Engraved onto crystal glass, why not have your company name and logo exposed - crystal clear with our Custom Engraved Brandy Glass? 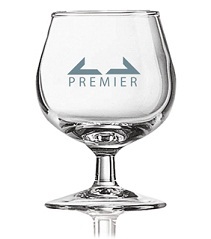 Beautifully cut and engraved, customers with simply love this promotional brandy glass as the perfect company gift and it will look stunning and totally professional. Customisable with upto 50 CHARACTERS for your display message, you can have pelenty of room for your company brand name and Logo to be engraved onto the surface of the glass. Why not have this lovely Custom Engraved Brandy Glass on your customers desk?